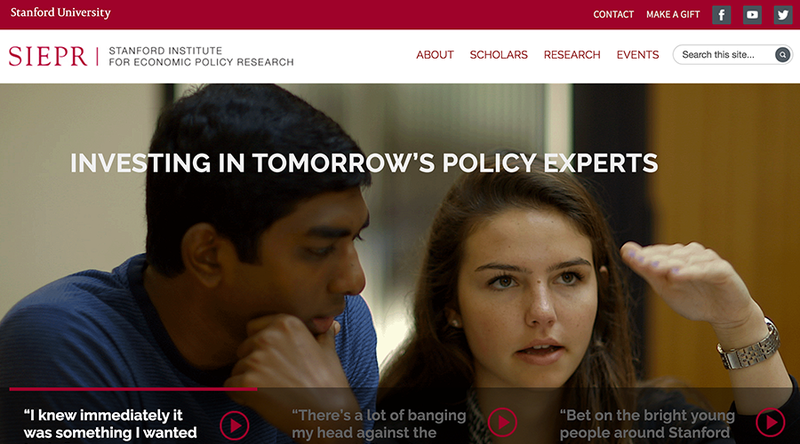 The Stanford Institute for Economic Policy Research (SIEPR) is a research organization committed to scholarship that helps address the real-world challenges facing governments and businesses in the United States and around the world. We are committed to make http://siepr.stanford.edu/ a perfect tool that supports SIEPR mission. We do this by providing information architecture and visual design that guides visitors to their destination with ease and pleasure. Rich video and visual content supplement detailed information on faculty profiles, research, student engagment and all other aspects of SIEPR work.